Day 21 of my Australia sojourn. I waited eagerly in the reception area of the resort to catch my 7am bus to the Daintree Rainforest. As I’ve mentioned, I’m sort of obsessed with plants. I also love heat and humidity, so rainforests are my kind of environment. A German couple sat on the couch opposite and we chit chatted about where we were going. Their bus came and went. An Aussie couple I had made small talk with at the pool came out, said they were going on “a brekky reccy,” and left. It was 7:15. An English family of four came and we didn’t talk because their bus pulled up as if queued to their arrival and whisked them away. I began to feel anxious. Jim had said 7:00, right? Maybe I had misunderstood. Maybe he had said 7:30; it was just 7:30 now, and maybe the bus was late. It was probably me—I had gotten too relaxed yesterday. People came and went. It was just past 8:00. The Aussie couple returned and were surprised to see me. Maybe I imagined it but I thought they looked at me pityingly. Pangs of emotion welled up. It wasn’t all the couples and families and no one else sitting by themselves waiting for a bus that never came. It was not wanting to waste a day. One day of leisure was enough for me. I want to do and see everything. Jim arrived to open the office and did a double take when he saw me. It turned out there had been a mix-up on the tour company’s end, and he apologized. “The two things I came all this way to see,” I replied glumly. Crocodile Adventures,” he suggested weakly. 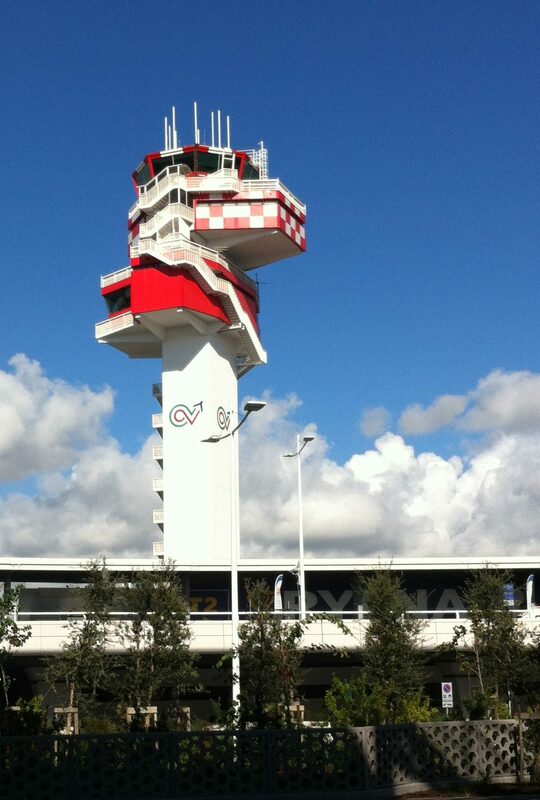 I had seen ads for this place in the airport, on the street, and in brochures for other attractions. They certainly were good self-promoters. I felt a surge of fear at the word ‘crocodile.’ Did I want to spend 5 hours in being surrounded by them? The place sounded like a totally tacky tourist trap. Hartley’s turned out to be pretty fun. There was much more wildlife than crocs. Did you know Cassowaries are prehistoric Kung Fu fighters with giant claws with which they can disembowel you? 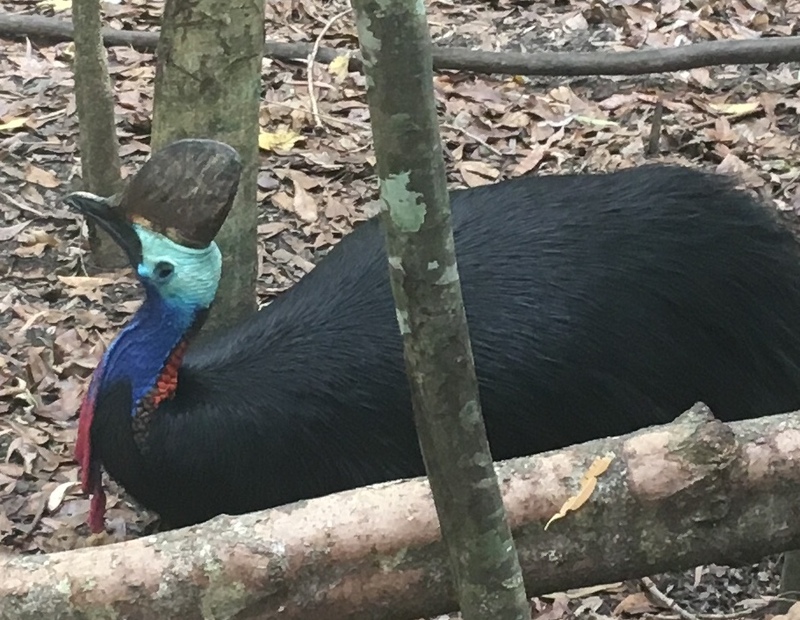 They’re actually very shy and avoid humans, but here’s video about how to survive a cassowary attack in case you decide to plunge into a jungle, locate one, and provoke it. 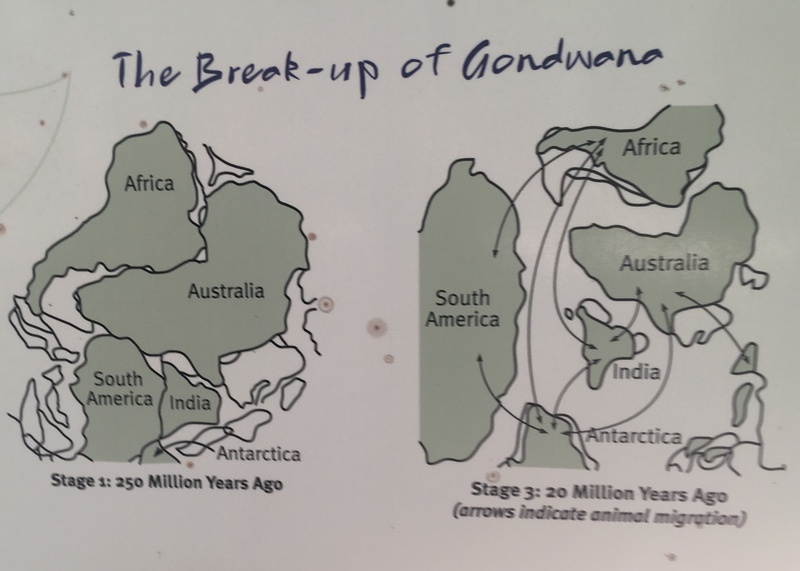 There was an interesting small exhibit about the break-up of Gondwana, the mega continent that had included almost all the continents. 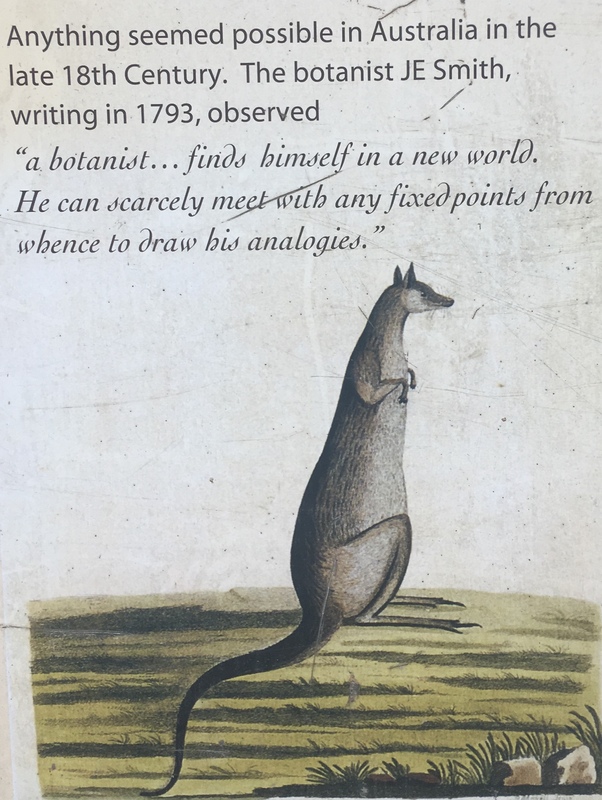 And about first encounters with kangaroos. 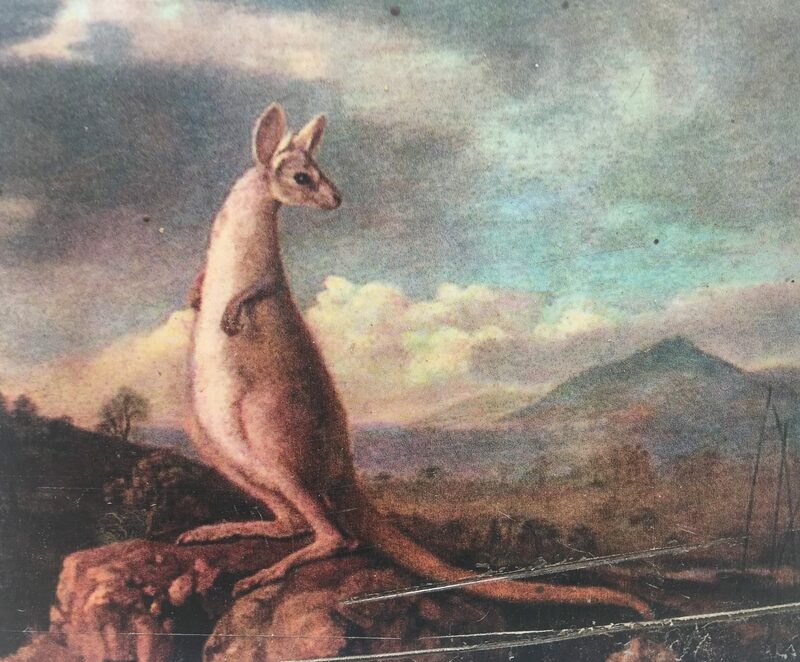 People back in Britain thought the explorers’ tales and early depictions of roos were tall tales until someone managed to bring back a live specimen. 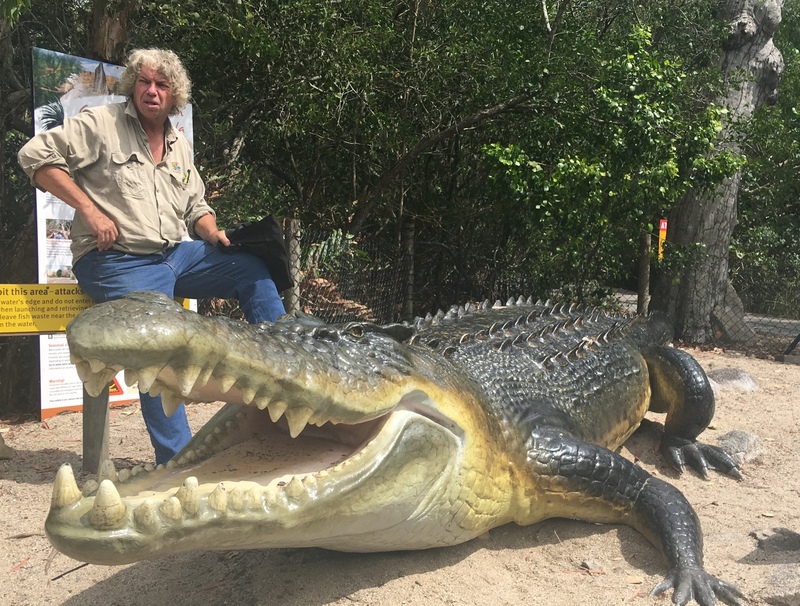 There was the obligatory croc boat ride, where a young blonde guy named Matt fed dead chicken parts to gigantic crocs and made dismemberment jokes. Having worked up an appetite, I had a burger in the café. 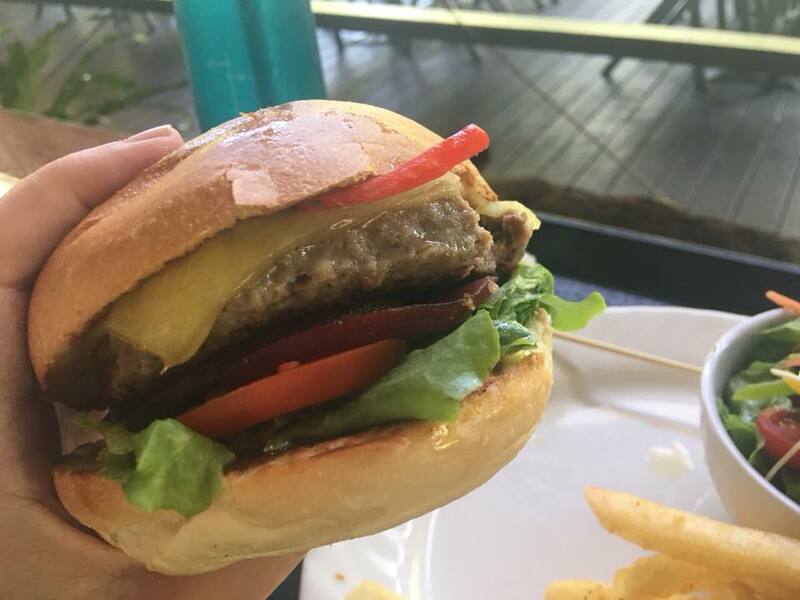 It had beets in it; beets on burgers are an Australian thing. 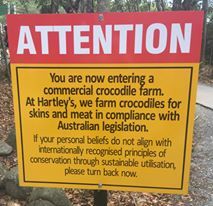 I toured Hartley’s crocodile farm. I’m not sure to which end of the spectrum this sign was directed—animal rights activists or poachers. Maybe both. 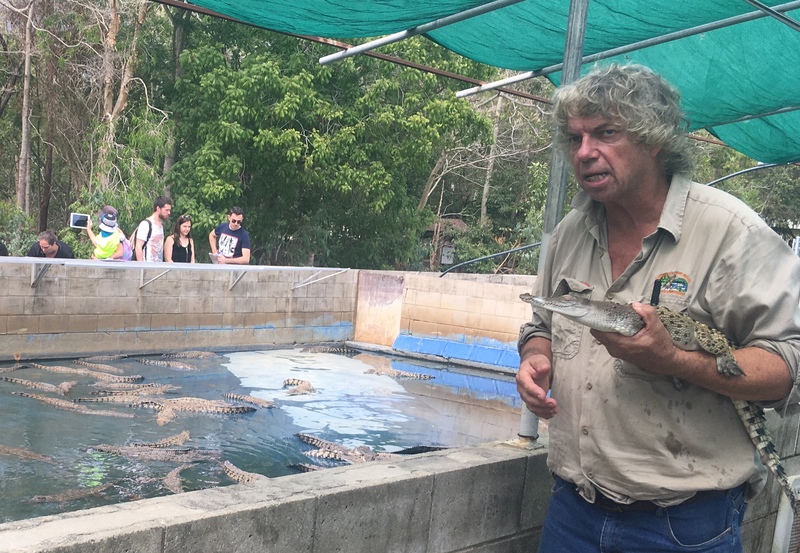 Our very earnest guide downloaded so much knowledge about breeding and raising crocs I felt confident I could start my own crocodile farm. 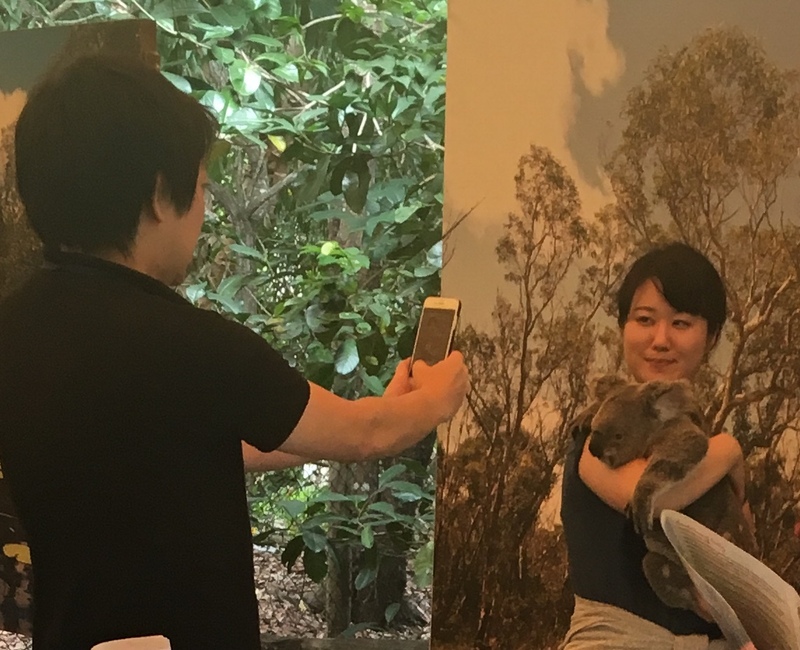 You could pose with a Koala for $$. The poor things. 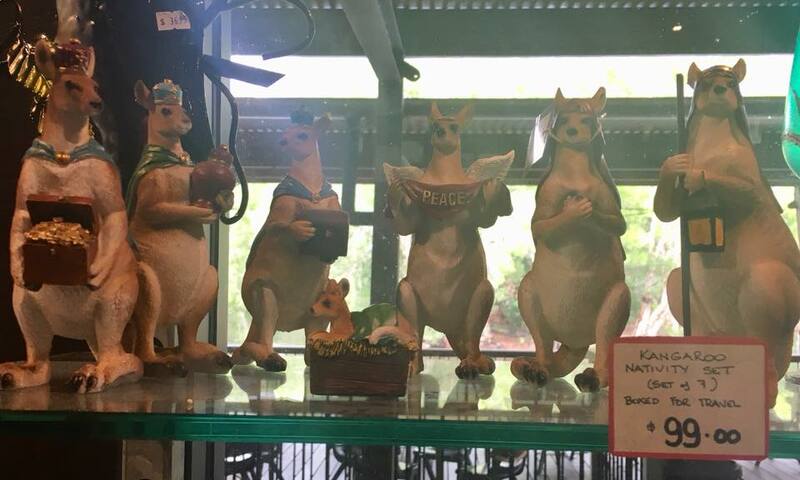 I bought yet more souvenirs in the gift shop. All my unsuspecting friends’ and family members’ birthdays and holiday presents for the next year were now covered. 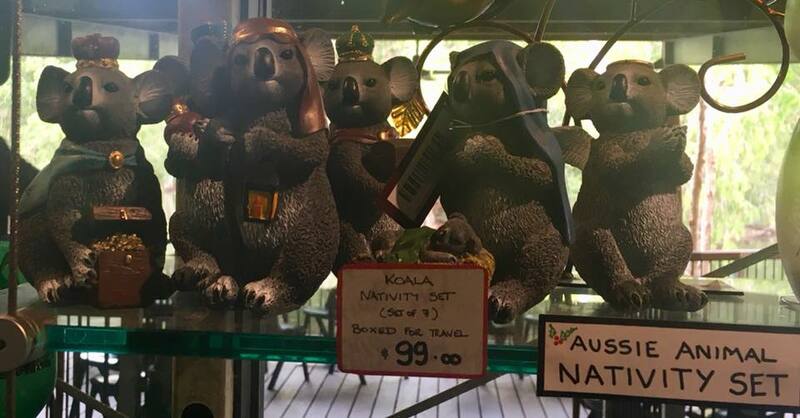 Which nativity scene would you have chosen—kangaroos or koalas? But I knew it wasn’t. 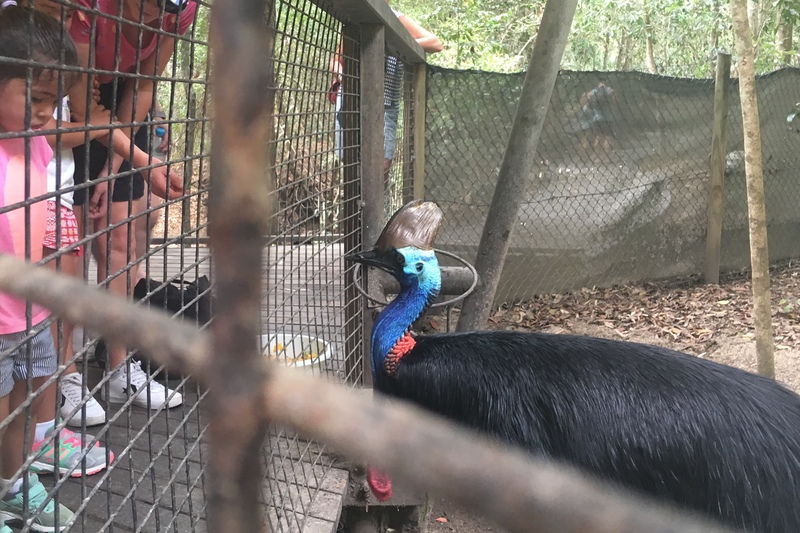 This entry was posted in Adventure, Budget travel, Culture shock, Living abroad, Travel and tagged Animal Conservation, Australia, Australian Wildlife, Solo Travel on January 29, 2019 by Breaking Free. I decided to write one more post before I leave for Belize. In my last post I noted that I have sometimes returned home in bad shape or to dicey situations. This post is about that worst time ever. There was that time I got bumped up to first class on a London to Minneapolis flight, was seated next to a handsome, single, and presumably rich man my age—but I had a terrible cold and I went through an entire box of Kleenex blowing my nose. He expressed sympathy at the start of the flight, then faced away from me for eight hours. I can’t say I blamed him. This was worse. I was dating a guy I’ll call Jed whose parents were Italian immigrants. He had been to Italy many times. Before I met him, Lynn and I had made plans to meet in Venice, and Jed was excited for me to see the country he loved so much. By the time the trip happened, Jed and I had been dating for about two months. By this point in a relationship, things have usually … erm, progressed … but not with Jed. He made the trek from Minneapolis to St. Paul every Saturday night to pick me up, sometimes with flowers or a nice bottle of wine, Italian of course. We would go out to dinner, have great conversations, maybe see a movie, then he would bring me home, kiss me good night, and leave. There was no groping, no heavy breathing, no frustrated desires. It kind of felt like a first date, every week. It was all very nice, but there was no sizzle. I thought that maybe if I was gone for a couple weeks, he would be dying to see me—and more. So I went to Italy and Lynn and I had a great time as usual. I bought a purple felt deco-style hat that Lynn said looked very “fetching” on me. I had an early flight home from London, so I booked myself into a Yotel at Heathrow. Yotels are cool little hotels in airports. The rooms are tiny but mirrored all around to prevent claustrophobia. For once, I was good and didn’t drink a bottle of wine the night before a long flight. Instead, knowing Jed would be picking me up, I hydrated like crazy and went to bed early to get my beauty sleep. I started feeling funny as soon as the plane landed. I stopped in a bathroom to check my makeup before meeting Jed, and my face was ashen and gaunt. The purple hat that had looked fetching the day before made me look like some sort of demented Dia del Muerte skeleton dancer. Still, I had plane hair so I kept it on. The look on Jed’s face told me I hadn’t just been hard on myself. He asked if I wanted something to eat and I said yes, thinking if I got some chicken soup it might make me feel less queasy. It didn’t. It made me want to hurl, violently. “I need to get home,” I said weakly. But I couldn’t remember which ramp my car was parked in. We drove around for a very long 15 minutes, me Trying Not to Throw Up in Jed’s SUV. Finally, we found my car and I made a dash for it without even kissing Jed goodbye. Thankfully he drove off so he didn’t have to witness me blowing chunks in the parking ramp. Oh, did I mention it was the coldest night of the year, around -20F (-29C)? Shaky, I managed to drive out of the airport before I pulled over, threw open the car door, and chundered on the side of the road. This happened three or four times more before I reached home, where the heat was turned down to 55F (12C). I cranked up the thermostat then started a bath of scalding hot water and lay in it shivering and shaking. What a long night. And Jed? I broke with him a few weeks later after a couple more Groundhog Day-like dates. This entry was posted in Adventure, Budget travel, Travel and tagged Being Single, Dating, Solo Travel, travel, Valentine's Day on February 13, 2017 by Breaking Free. It was my last night on the Amalfi Coast, and I was determined to find some good seafood. I had tried the places listed in guides and struck out. Then I turned a corner and saw what looked like a stage or movie set. It was a restaurant set on a crazy 45 degree angle street corner, and they had put about 10 little tables out on the sidewalk, which jutted way out into the street and dipped down at an angle. The maître de led me over to a table and when I sat down I felt like I should have memorized my lines. I was the only customer. The tables were draped in shiny dark blue satin, the chairs and table were wobbly, and the menu was grimy. There was one of those big placards at the entrance that should have warned me to keep walking. It promoted daily “specials” like fish and chips, hamburgers with fries, and pork chop with sauerkraut—something for every nationality of western tourist. The maître de, whose namebadge said Enrico, appeared to be in his 60s. He was dressed in worn dark blue trousers and a zip-up sweater that looked like what I wear at home when I’m not leaving the house all day. Yet despite his rather shabby dress, he acted as though he was working in a fine establishment. He had a napkin draped over his arm and snapped his fingers and yelled, “Waiter!” Maybe the food would surprise me and be astoundingly fresh and flavorful. “Uh … Slovakia? Poland? Ukraine?” Was Ukraine part of the EU? “No—Romania!” he exclaimed delightedly, as though he had fooled me, then bounced away. Enrico continued to stand by my table while I perused the menu, which did not give me hope for a great meal. “What do you have with seafood?” I asked optimistically. Enrico pointed out the only item on the menu that I had already passed on, seafood linguini. Maybe the photo just didn’t do it justice. “I’ll take that,” I said, trying to muster some enthusiasm. Enrico told me his life story. He had worked in the “hospitality industry” in London for 13 years. 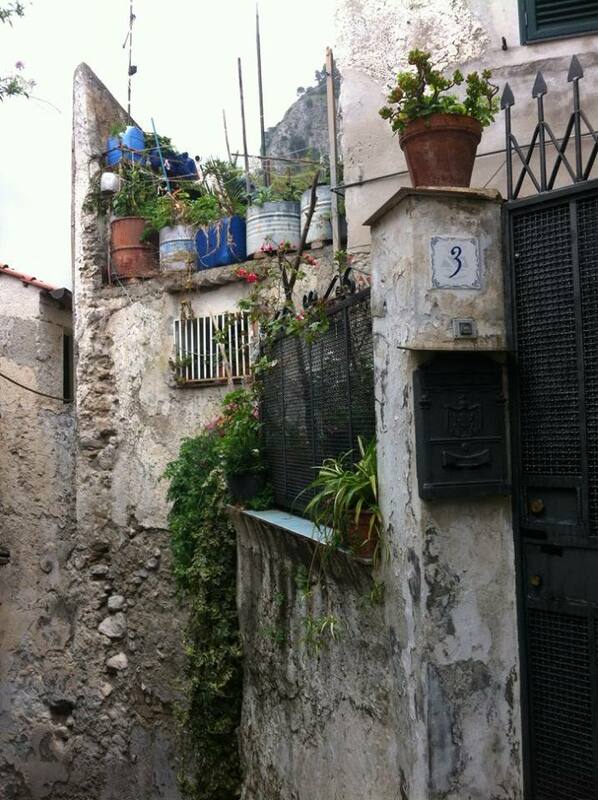 That explained why he kept calling me “love.” It was so dead in Sorrento in the winter that even the cats went south. He would go to Orlando in a few weeks; he had a condo there. “I will sell if Trump is elected President,” he laughed. My food came and it was as disappointing as I had expected, with obviously defrosted seafood mostly consisting of mussels the size of peas. But I was hungry, so I ate, and Enrico continued to stand next to me and talk. I began to wonder if he was hoping for some lady companionship later, but just then some tourists came walking along the street and he moved off to try to entice them in. They looked at my food and kept walking. Enrico circled back to my table. “Say, do you know why there’s such a crowd in front of the Church of St. Antonino all the time?” I asked. Enrico screwed his eyebrows together, thinking. “Ah, yes, it is the Virgin of Pompeii. She is a visiting for the month of November.” Just to be clear, we are talking about a plaster statue with magical properties, not a real virgin. This entry was posted in Adventure, Budget travel, Culture shock, Travel and tagged Amalfi, Italy, Solo Travel, Sorrento, travel on January 12, 2017 by Breaking Free. 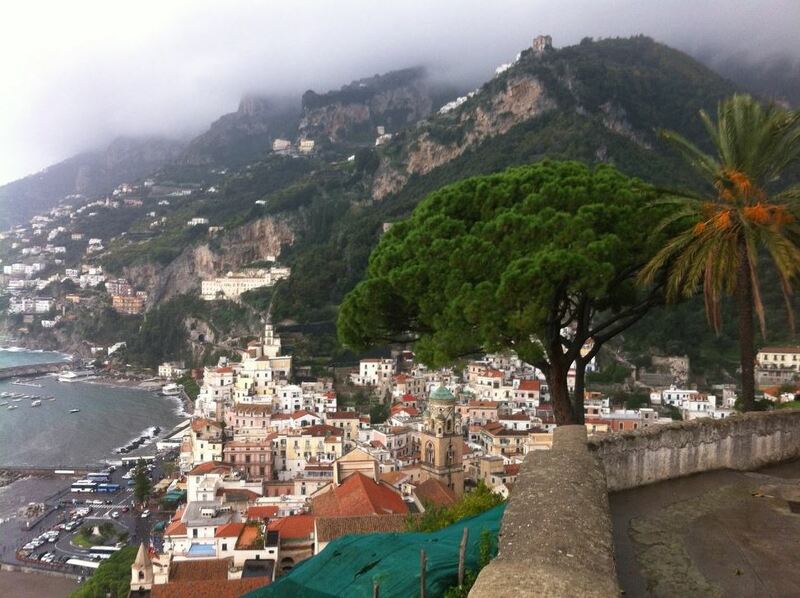 It was time to move on from Amalfi to Ravello. From across the road I watched as a bus signed RAVELLO pulled away. I walked to the schedule board. There had been something online about the bus leaving every 10 minutes so I didn’t put a lot of effort into it but it was indecipherable anyway. A tall pensioner dressed for a safari was also trying to make sense of the timetable. After a few minutes we gave up and started to chat. “Oh no,” he laughed as though this were a silly question. “My GP says I’m healthy. I’m just old. One of these days there will be a fall, or a burst blood vessel, and then I’ll be bundled off to a home. Sometimes I think I should just jump off a cliff and get it over with.” And here we were, surrounded by cliffs. I didn’t ask if he was widowed or had children; they had probably been killed in a tragic accident. He eyed me and said wistfully, “You’re just a child.” This made me feel more awkward. Was he just a nice old man, or a lecher trying to flatter me? Based on his accent, I made the mistake of saying something about tough English people who were independent well into their centennial year. He proceeded to inform me about the history of Jersey, the relationship between the UK and Jersey, and Jersey cows. “You have heard of Jersey cows?” Ye-es. I don’t think he was patronizing me. I think he was depressed and lonely—at home and everywhere. He was one of those people who badly wants friendships but isn’t good at them. He never asked me about myself, but launched into monologues about Italian history and his favorite country, Morocco. He was one of those men who is a walking encyclopedia, with a library of books at home on history, geography, world religions, warfare, anthropology, and politics. They have seen every war film and documentary, have visited Normandy and Pearl Harbor and spent days in the Churchill War Rooms at the Imperial War Museum. They can name every regiment and what kind of tanks or planes were deployed and how many men died in the Battle of Nanjing and the siege of Leningrad and the Bataan Death March. And now that these men have Google, it’s like they’re on steroids. I sometimes worry that I have this tendency. I am always conscious of not spewing people with verbal diarrhea, especially if I’ve been traveling solo for a while. Of course there are men, and women, like this in every land, but the British and their cousins seem to produce more, maybe because of their national fixation on World War II. That’s not a criticism—they had the #@$% bombed out of them and then my country forced them to pay war reparations, which prevented them from rebuilding as quickly as they could have. We Americans would do well to emulate their habit of reflection. Forty-five minutes passed and people were crowding onto the platform. A young guy who turned out to be honeymooner from St. Louis asked if we thought they should go to Venice. He was a stereotypical super friendly American. A nice guy, to another American. My new Jersey friend and I endorsed Venice. “It’s dark and decaying, in a lovely way,” I offered. “Don’t miss the cemetery island.” Me and my cemeteries. “Oh, I give up! I’m going back to Sorrento,” Jersey declared and walked off. 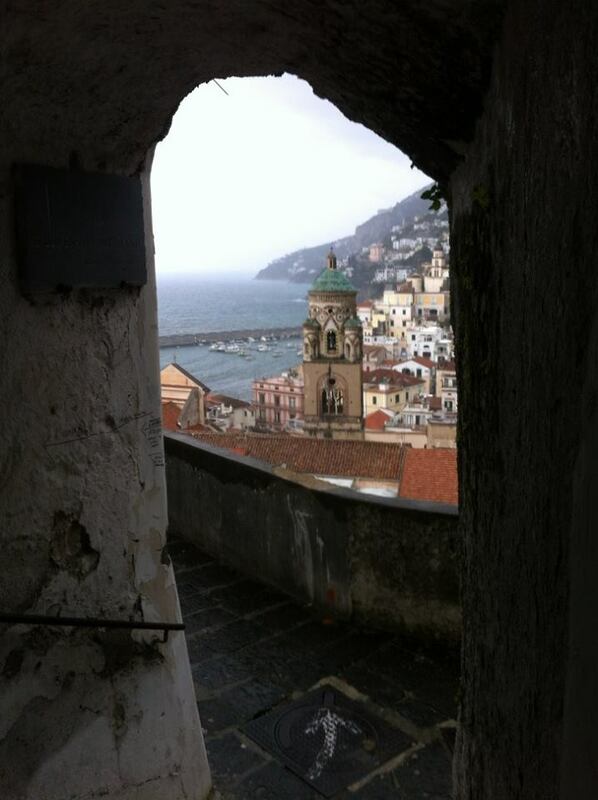 This entry was posted in Adventure, Budget travel, Culture shock, Travel and tagged Amalfi, England, Italy, Jersey, Ravello, Solo Travel, travel, Traveling Alone on January 8, 2017 by Breaking Free. 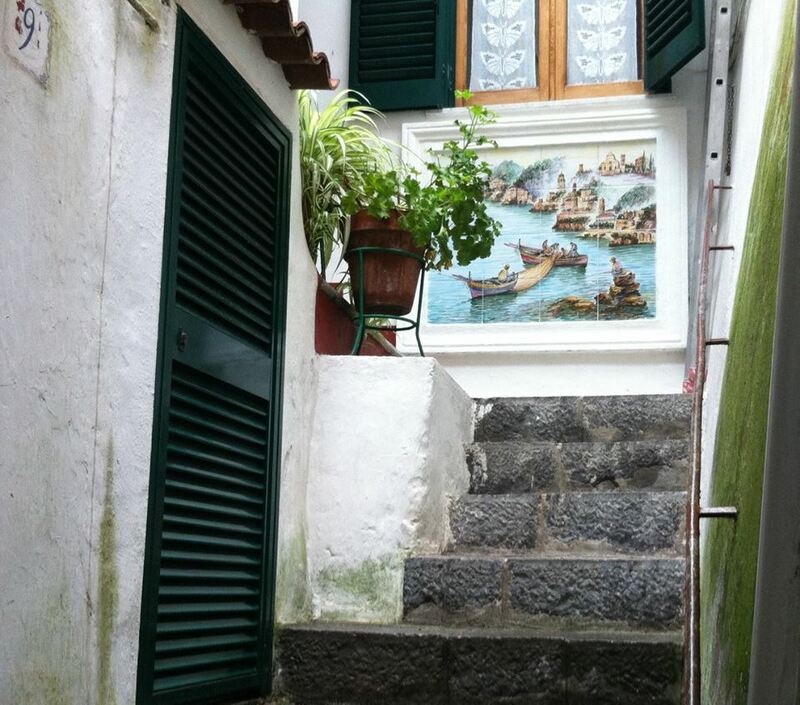 I had seen the one attraction in Amalfi, the Paper Museum, in under 15 minutes. I wandered back toward the center of town, then saw a little sign that said “Ancient Stairs.” Of course I had to follow it. Whoever wrote the sign wasn’t kidding. The stairs were stone, worn concave by thousands of footsteps. They were also slippery as hell—at one junction my left leg slid left and my right slid behind me, leaving me face down, arms splayed in the “worshipful peon” position. Having torn my knee ligament two years ago, I was relieved to get up and feel okay. I was also reminded of one of the pitfalls of traveling alone. The town was deserted. Who would have helped me up, then down all those stairs if I had torn my MCL? I began paying more attention to my steps. These mailboxes may seem unremarkable if you are Italian, but in Minnesota everyone is named Johnson, Swanson, and Anderson, so they were charmingly exotic to me. There was another sign that pointed to a Cimitero. I love cemeteries and, having no other plan, decided to visit. Heartbreakingly beautiful, eh, even with the rain? 500, 600, 700 … Here’s a tip: Go while your knees are still good. I figured they couldn’t possibly be headed for the cemetery. Only I was weird enough to hike 800 stairs to see headstones. So I smiled and kept going. This was as far as I got because when I turned around from shooting this photo I saw the sign for the cemetery, which had closed five minutes earlier. FIVE minutes! Again, this is one of the hazards of traveling in the off season, many sites have limited hours. The hiking couple had been right, there was an orange plastic fence across the path just beyond the cemetery entrance. I stood there a moment, waiting for some special feeling and, feeling none, turned around and walked back down the 800 steps. All that hiking had helped me work up an appetite, and not for a protein bar. I found a hole-in-the wall pizzeria (it seemed like every restaurant in Italy was a “pizzeria”). For 4€ I got an enormous sandwich with grilled red peppers, eggplant, and onions smothered in melted mozzarella, and a Coke Pink, which was everywhere. Since I come from a land where we must huddle inside for six months of the year due to the cold, I always sit outside when I’m traveling, even if it’s raining, which it still was. I pulled up a café table under the awning, leaning in to stay dry. We laughed and chatted about languages; it was nice to have a little human interaction. Then the English guy asked me what I thought about Donald Trump. What a buzz kill. I made a noncommittal comment, wolfed down my food, and walked off. 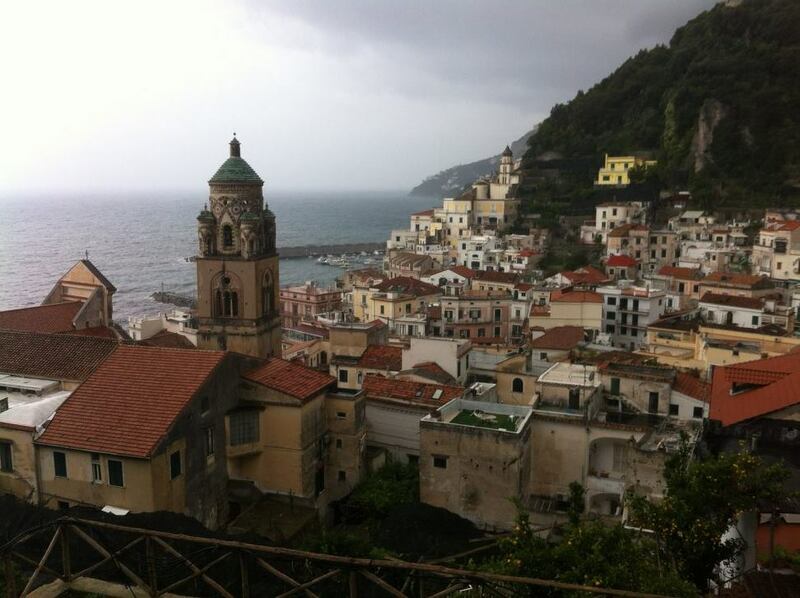 This entry was posted in Adventure, Budget travel, Culture shock, Joie de vivre, Travel and tagged Amalfi Coast, Great Hikes, Italy, Solo Travel, travel, Traveling Alone on January 6, 2017 by Breaking Free. 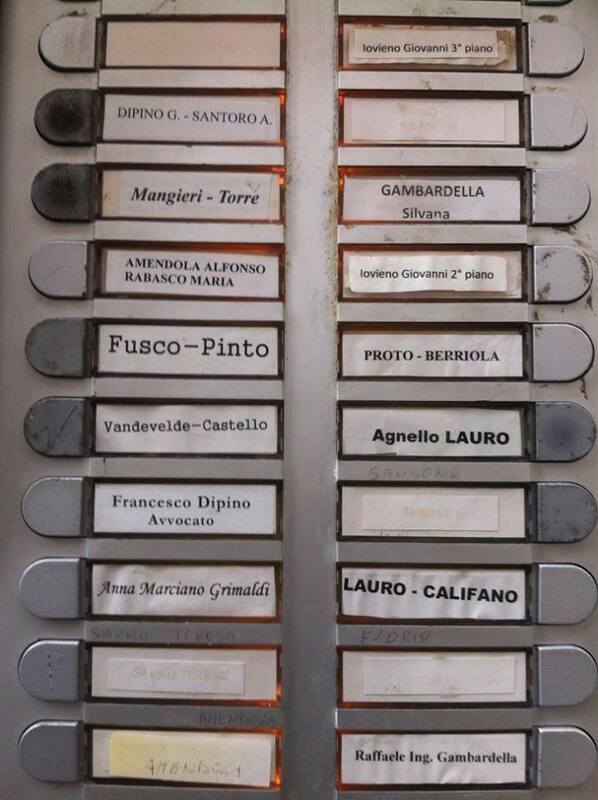 I would find it to be emblematic of Italy—colorful and confusing. The guide books and websites tell you to take the Michelangelo Express from the airport into the city. I scribbled down directions for walking from the train station to my hotel. How hard could it be after flying 5,000 miles, on no sleep, and with a full-sized suitcase and a big backpack? Why spend 10€ on a taxi when I could walk for free, right? “Why wouldn’t everybody do it?” I wondered. “Because they don’t know it exists,” she laughed. It sounded too good to be true. Since it had no name, I couldn’t Google it. I couldn’t find anything on Trip Advisor or in guide books. But it did exist, and it was great to go directly to my hotel instead of schlepping myself and my luggage from the train station. Plus, since it wasn’t a train, we drove through the city and I got a nice little sight-seeing tour as a bonus. Welcome to travel, where mysteries abound. All you can do is laugh a little, go with the flow, and hope for the best—or at least for a little adventure. I have spent time in hotels known as romantic getaways, and it can be depressing to be surrounded by couples mooning over each other. There are safety considerations, and it’s worthwhile trying to find a place where you don’t pay a double occupancy rate. Sometimes it feels like I am the only one traveling alone, but I’m not. We’re out there, and dozens of women had taken time to suggest solo-female-friendly hotels. I’m not aware that the hotel category “single” exists in the US, but it does in Europe. In fact, maybe due to the age and quirkiness of European hotels, I have stayed in rooms with three twin beds, four twin beds, and now at the Hotel Italia, I would stay in a tiny room with one twin bed. The front desk guy was Indian, of course. He seemed melancholic and perhaps a bit resentful, that he had been meant for greater things than running a two-star hotel. But he was nice enough. He opened a city map and did what he had clearly done many times—marked the hotel with a big “X”, circled the Big Sights and told me how far they were, and described how to take the metro to the Vatican. “What time does it get dark?” I asked. It was already 2:30 and I wanted to get out there and see what I could before nightfall. Well. That was discouraging, but I wouldn’t be able to stay awake much beyond 7:00 anyway. 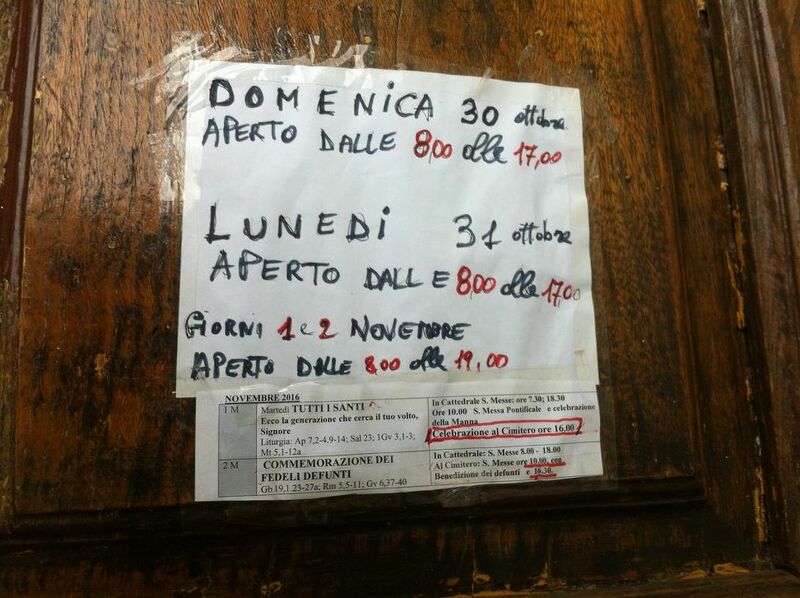 The Hotel Italia website proclaims itself a “Cheap Hotel” and they aren’t kidding. It cost $85 a night to stay in central Rome, within walking distance of the Coliseum, and included breakfast and a free bottle of Prosecco to boot. I tipped the bellman who showed me my room, tossed back a glass of Prosecco, then headed out to find the Coliseum. This entry was posted in Adventure, Budget travel, Travel and tagged Italy, Rome, Solo Travel, travel, Traveling Alone on December 3, 2016 by Breaking Free.